Crowdfunding on Crowdcube is not only a way to source investment, it's also an opportunity to raise awareness of your brand and convert your customers, contacts and fans into investors - a crowd of your biggest supporters and advocates for you and your business. When thinking about how to promote your crowdfunding raise, keep it simple. Think about what marketing usually works for your business and apply it to your crowdfunding raise. Email can be a cost efficient and effective channel to promote and build the momentum of your raise. We recommend that you keep your emails concise, focusing on the key messages you’ve outlined for your crowdfunding campaign. Your emails should also be visually engaging with the inclusion of some imagery and most importantly, include a prominent call to action. We suggest sending a series of ‘warm up’ emails to your network to ensure they are aware of your raise, and the opportunity to invest, before your pitch launches on Crowdcube. To help keep potential investors engaged and up to speed with your campaign, we also suggest sending a series of targeted follow up emails. For example, a launch announcement on the day your pitch goes live on Crowdcube, at important milestones throughout your raise (for example when you reach 50%, 75%, 100% etc.) and a ‘last chance to invest’ email at least 24 hours before the pitch closes to investment. Preparation is key. Running a crowdfunding campaign is fast-paced, so make sure you have your emails prepped and ready to go in advance of launching on Crowdcube. Tip: Keep your subject lines short and to the point, to intrigue your audience and ultimately, increase open rates. Avoid special characters and ambiguous language that could result in your email going to spam. If you don’t already have an email service provider, we recommend MailChimp. Warm up your network of customers, colleagues, friends, family and potential cornerstone investors by letting them know you’re crowdfunding and that they can invest and become a shareholder in your business. Personalised and targeted communications are usually more effective at driving traffic and investment to your pitch. Start by segmenting your audience and developing a tailored and personalised communication for each of them. You may decide you can send the same email to your customers, but choose to talk to your suppliers or angel investors differently. Tip: Your network may know about your business from a consumer’s point of view but not from an investor’s perspective, so you will need to sell your business rather than just promoting your product. There’s nothing new about a business that’s crowdfunding, so your release will need to cover more than just your raise on Crowdcube. You’ll need a hook to pique the media’s interest, so think about how you can tie the news of your raise into wider communications. It’s definitely quality over quantity when it comes to your release, so keep it short and sweet, ideally just one page. Get to the point early on in the release by covering your key messages in the opening paragraph, you can expand the story later on. A punchy and interesting headline always helps! If you’re not pitching for an exclusive piece of coverage, spread your net wide by sending your release to the relevant trade press. If you can adapt the release for each of the various audiences, even better. Make sure your pitch is live on Crowdcube when you expect the news to hit the press so you can reap the rewards of the coverage you receive. For many investors, the team is an important factor to consider when making an investment. Investors not only invest in an idea, they invest in the people behind the business, so hosting an event gives potential investors the opportunity to meet you and get a real feel for the business. If you decide to host an event, it doesn’t need to be a costly or overly formal affair - host an event that reflects your business, whether that’s an open office, drop in sessions, drinks reception, breakfast event or even a webinar. A quick word on compliance: please remind attendees that their capital is at risk. Referral traffic is the method of assigning traffic or visits that came to Crowdcube.com from your website. 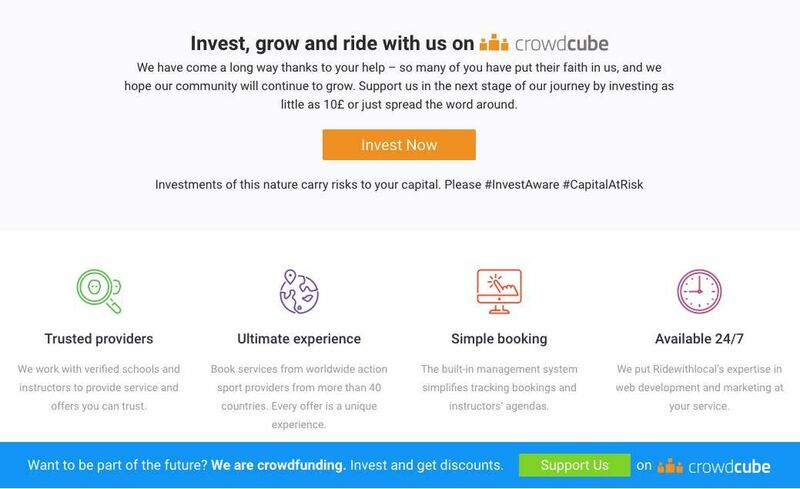 For example, when someone is signposted towards your equity crowdfunding raise, clicks on a hyperlink and is sent from your website to Crowdcube.com. The audience that is most likely to support and invest in your business are your existing users and visitors. This audience is most receptive to your marketing attempts, as they already have an awareness and understanding of your brand, products and services. Tip: We often see that businesses that engage their existing website traffic and send higher volumes of referral traffic to Crowdcube.com are more likely to reach their funding target. If you don’t have an in-house design team, we’ve created some simple banners that you can use across your website or as an email footer. Work with your web team to build either a static fixed header that can be loaded, most importantly, on your homepage but also sitewide (on every page). Please see below some examples of signposting headers and footers. If you have the resources available, you can also build creative blocks and assets that can be placed within your homepage carousel or sit fixed for the duration of the raise. Put your raise front and centre on your website, it will only help build the interest and momentum in your raise. To support the warm up emails that you are planning to send, you are going to need a landing page on your website. PRE: populate it with content to support your campaign warm up emails. Use this as the destination to send your email, social and website visitors. DURING: use this page to present your crowdfunding raise to your audience on your website. Updating the page as your raise reaches key milestones. POST: when your crowdfunding campaign has finished, leave this page live. Link through to your company page on Crowdcube.com. This will enable you to benefit from SEO link building with Crowdcube and the wider crowdfunding and alternative finance space in the long term. This will also ensure you have everything in place if you decide to return to Crowdcube for further funding in the future. Your investor base can also use this page to navigate to your company profile page on Crowdcube.com where your company news, trading updates and companies house information lives. Our ability to help you reach your funding target through certain digital mediums does require us to leverage audiences, search volumes and known users. If your brand is new with low Google search volumes, and low numbers of Facebook and Twitter followers, then building campaign momentum via these channels is very difficult. This does mean your business will be more reliant on Crowdcube and its existing activities within the digital landscape, which will be running throughout the duration of your campaign (outlined below). Crowdcube has spent years testing, learning and optimising our digital channels. Unfortunately, Crowdcube cannot add your conversion pixels to our website. Pre, during and post raise it is likely that you will be running a number of campaigns across different channels. We kindly ask that when building and launching any digital marketing activity you add UTM tracking to all URLs using the Google Analytics query string tool builder: Google Analytics Tools. For help and support on this speak to your Equity Campaign Manager. Organic: creating posts or tweets that are sent out and seen by your audience that has already Liked your company page or Followed you. Paid: creating posts or tweets that attempt to drive awareness, consideration and conversion. This activity can target lookalike audiences, interests and behaviours. Crowdcube already benefits from having large audiences on Facebook, LinkedIn and Twitter, which we use daily to spread, share and syndicate everything that is happening on platform. Crowdcube runs a number of ongoing acquisition and engagement campaigns within the Facebook and Twitter environments. We also have the ability, based on our rich data and the audiences we have created over time, to build campaigns around interests, behaviours, categories and lookalike audiences. If you run your own paid activity on Facebook or Twitter we ask that the correct UTM tags are applied so we can report back on the results. If running campaigns on Facebook the best performing campaign to date has been a business with a large following, who used the Reach objective in Facebook to maximise the impact of their marketing message regarding the raise. Historically Crowdcube has generally seen better acquisition and engagement results from Facebook. However, your business is unique and you know it better than we do, so market on the platform that you know your audience are most likely to engage with. From our experience, marketing on LinkedIn has been expensive as it focuses on a display cpm pricing model. Since its acquisition by Microsoft, new roadmaps have been released which fit more in line with Facebook and Google Marketing models, so it is worth keeping an eye on the possibilities here. Crowdcube runs a retargeting campaign with Criteo, this retargeting tool places adverts of your pitch in front of users who have visited Crowdcube.com and the pitch page. These ads appear across the Criteo publisher network and on sites including Facebook. The Criteo algorithm is rule and bid based - the more referral traffic you send to your pitch page the more ads are likely to be shown. The closer your business gets to its funding target the more we bid to show the pitch in the ads. This helps to promote your business to the right audience at the right time in the most cost effective way. If you have a physical location with high-footfall, like a retail or restaurant site or even an ecommerce store, you can use promotional materials at the point of sale to promote your raise to people who are already familiar with your business. Think about what would be most relevant and suitable for your business, whether it’s including a leaflet with every in-store or online purchase, handing out flyers, adding graphics to shop windows or changing the staffs uniform, the choice is yours. Make sure anything you use stands out and is visually distinctive - you don’t want your customers to dismiss it as another menu, sales promotion or event. Whilst staying true to your brand, you may want to use a different colour, or type of illustration, to what you normally use for the promotional activity related to your raise, giving the campaign it’s own visual identity. Tip: How about adding extra information to the purchase confirmation page on your website (as well as your homepage as outlined above)? Once people have bought a product from your site, direct them straight to your raise and encourage them to invest and be part of the business’ future.